In the sports world a three-peat is defined as a rare occurrence when a team wins three consecutive championships in its respective league. It’s so rare that in major American professional sports it has happened just 16 times. The powerhouse Lady Warriors varsity basketball team made it a three-peat with a 61-45 win over Holyoke High School on Saturday. They capped a perfect season and secured a state title for the third time in as many years. 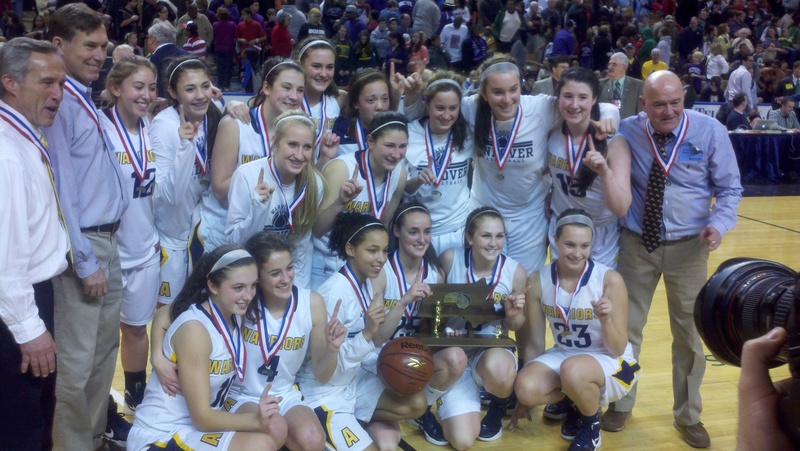 Andover is just the second team from Massachusetts Division 1 to accomplish this feat, and the first since Haverhill did it in the mid-1990s. Senior co-captain Nicole Boudreau lead all scorers Saturday by finishing with 31 points in her final game as a Warrior. Given the significance of the win, it seemed quite fitting when Boudreau opened the game with a three-point shot. The Purple Knights of Holyoke High were leading by 2 at the half but the Warriors defense proved too much for them. The talented Boudreau will take her talents to Boston College next year. She will be greatly missed in the Andover basketball community.